Standing L to R: Kelly Northcutt Hayes and John Mack Green. Seated at center is Nathan Leavitt. 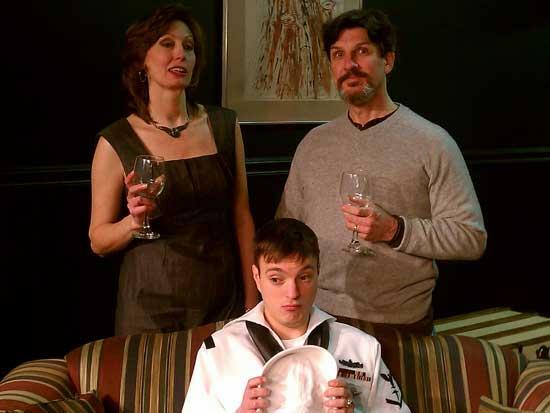 Adopt A Sailor by Charles Evered and directed by Bob Fish opens Thursday, February 10 for a three week run at Out Front on Main, Inc. The show dates are February 10-27, Thursdays-Saturdays at 7:30pm and Sundays at 2pm. Tickets are $10. general admission and $5. students/seniors. Tickets and Info (615) 713-1757 or www.outfrontonmain.com Out Front on Main, Inc. is located at 1511 E. Main Street in downtown Murfreesboro beside MTSU. A young navy corpsman from Arkansas hits New York City during Fleet Week, spending the evening with an affluent but dysfunctional Upper East Side couple who has volunteered to host a sailor – only they’ve forgotten. Richard is excessively intellectual, obsessing about his weaknesses and how to express his masculinity in the modern world. He has no job but spends his days thinking about making artsy independent films. Patricia runs an art gallery and longs to recapture the excitement and possibilities of her youth. After years of childless marriage, this union is nearing dissolution. Through the evening, the couple voice their failing love, while the sailor shares some of his small town fears and frustrations about becoming an adult. When sparks fly from the clash of Arkansas innocence and Manhattan sophistication , all three begin to find new and healthier perspectives on their lives. Someone described this show as “Who’s Afraid of Virginia Woolf” meets “Forrest Gump.“ Adopt a Sailor is at once hilarious, brutal, and genuinely tender while examining the political and cultural conflicts of our current society. The cast includes John Mack Green as Richard, Kelly Northcutt Hayes as Patricia and Nathan Leavitt as the Sailor.